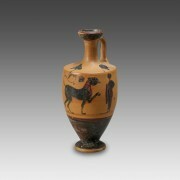 A beautiful Epichysis with a squat belly and a high, slender neck ending in a long beaked spout. 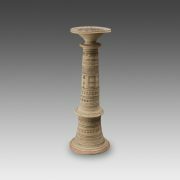 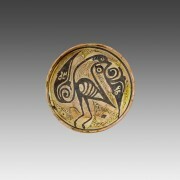 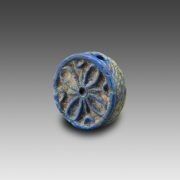 This particular shape is referred to as an “epichysis”, and recalls an oinochoi with a low body reminiscent of a pyxis (box). 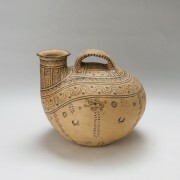 The word askos originally designates the skin of an animal that was sewn and turned into a skin intended to carry liquids, especially wine or water. 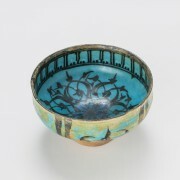 A light beige-gray ceramic bowl, covered with a white slip; the decoration is painted in black under a beautiful turquoise glaze, thicker on the bottom where it partially dripped. 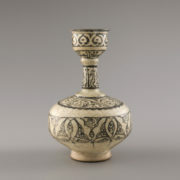 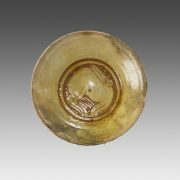 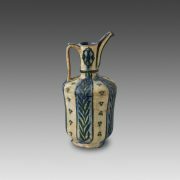 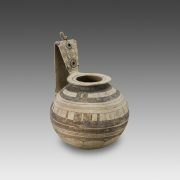 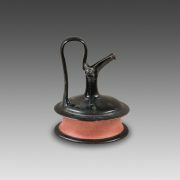 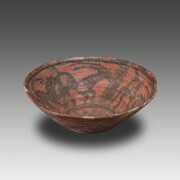 This turned bowl is made of beige ceramic covered with a red slip; decorated patterns are painted on the inner wall of the vessel only, with thick lines and in blackish brown color.